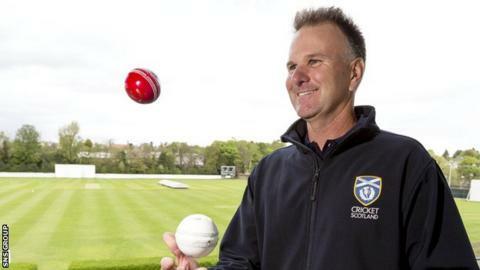 New head coach Grant Bradburn believes Scotland can realise their dream of becoming a Test playing nation. The New Zealander said he had been lured by the challenge of developing Scotland as a cricket nation. "Yes I do [believe Scotland can become a Test nation]," said Bradburn. "I wouldn't like to put a time frame on it, but I'd love to be involved. "We need to develop our skills. There's a massive difference between 13th in the world and the top 10 [Test sides]." The International Cricket Council recently announced that the leading associate nation would play the bottom Test side in 2018, with the winner granted 'Test' status. "At the moment, realistically, Test cricket is the dream and I would love that to be turned into a goal," added 47-year-old Bradburn. "But I wouldn't do that until I get my chance to get my feet on the ground and assess our playing stocks and start developing the skills I know will be needed to be competitive at Test cricket. "But it's a fantastic dream to have. The ICC have opened the door and made it realistic for associate teams to give themselves an opportunity to play Test cricket. "Therefore the longer version of the game will become more important to us." Bradburn, who will take up his role on 1 July, is replacing Pete Steindl who left in December after failing to reach the World Twenty20. He will be assisted by Craig Wright, who took over alongside former England batsman Paul Collingwood on an interim basis for the successful World Cup qualification campaign. "For me, there was an instant attraction to the people for a start," said Bradburn. "We had synergy with our plans and philosophies around game development and a long-term vision for developing quality players. In short I'd like to achieve continued success with more Scottish players featuring on the world stage. "I only arrived yesterday but I've done a little bit of homework on the squad. "But the exciting thing is that I will be walking into an environment where I don't know the players and I don't know staff that well. "However, I do know that they have had some success recently and there is some quality people in this organisation and I'm really looking forward to brining the experiences I have had as a coach and applying that to what is required here." Scotland host England in a one-day international in Aberdeen on Friday, with Wright in charge of the side.